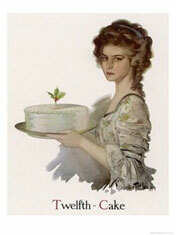 The Twelfth Night was still the highlight of the Christmas season and Twelfth Night cake was served. 1714 George 1 established Plum pudding as the main Christmas desert. Turkey replaced beef on Christmas Day. The working-classes had goose on Christmas Day (cheaper but tougher). Twelfth Night cake was replaced by Christmas cake. 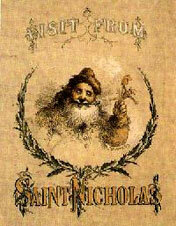 1822 A Visit From Saint Nicholas (by Clement Clark Moore?) was published in America. It was based on the Dutch view of Saint Nicholas (Sinter Klass) and it introduced him, his sledge and his reindeers to the English-speaking world. 1833 The Factory Act gave two statutory holidays to workers, they were Christmas Day and Good Friday. 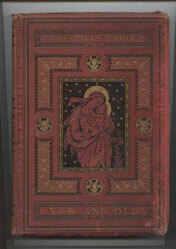 William B Sandys’ Christmas Carols Ancient and Modern published in UK. Featured First Noel. Hark the Herald Angels Sing and God Rest Ye Merry Gentlemen. C19 Plum pudding replaced by Fruit pudding as the Christmas desert. 1841 Prince Albert added a Christmas Tree (as it was a German Tradition) but the tradition is much older in Northern Europe, The 1846 royal tree is shown here. 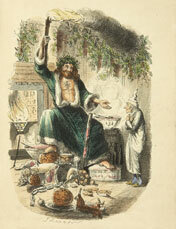 1843 A Christmas Carol by Charles Dickens published. It emphasised a family Christmas as before it was either a a community celebration or church -led. Christmas had declined in C17 onwards due to Puritan opposition. 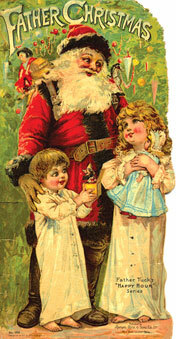 Henry Cole,introduced world’s first commercial Christmas card. It replaced the traditional Christmas letter. 1846 Christmas cracker invented by Tom Scott a London confectioner. 1847 Poor Law established a Christmas Dinner in the workhouse. 1840s Trend now was to give Christmas gifts instead of New Year presents. 1853 Christmas stockings were popular amongst the working-classes. 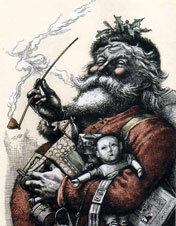 1854 Santa Claus introduced into UK in the book Christmas Stocking by Susan Bogert Warner. 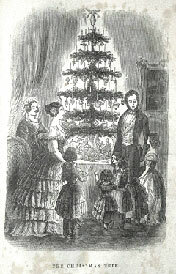 1855 Christmas Trees had became popular in middle-class households according to the Lady’s Newspaper. Presents under the Christmas Tree rather than in stockings. 1860s Christmas Pantomimes (from Italian Harliquinade) adapted Nursery Rhymes. Paper decorations replaced greenery. 1863 Christmas cards now being printed. 1870s Christmas paper hats introduced. 1880 Bishop Benson introduced the Festival of Nine Lessons & Carols at 10pm in order to keep men out of the pubs in Truro Cathedral. It was used by other churches in the UK and overseas. (Kings College Cambridge adopted it in 1918). 1881 Thomas Nast drew Santa Claus as a rotund elderly man with a beard and a red jacket. 1890s Electric lights added to Christmas trees (previously lighted candles were used). 1900 Queen Victoria was still sending presents at New Year rather than Christmas. 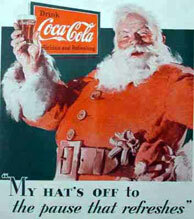 1931 In the US Coca Cola standardise Santa’s appearance in red costume with white fur trimming. Annual Christmas Message by radio to Britain & Empire started by George V who spoke on BBC Radio after being encouraged by Reith. 1950s Working-classes could now afford turkeys and presents. Toys now produced by US and Japan for the UK market. UK towns added street decorations. 1957 Queen Elizabeth I’s first television message. First television message by a British monarch. 1958 Christmas Day became a bank holiday in Scotland. 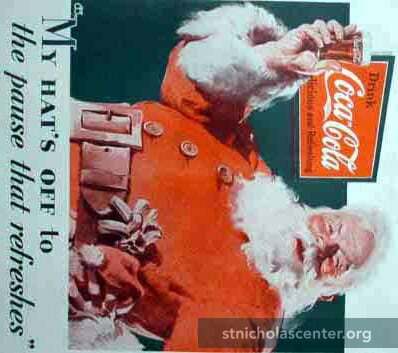 1960s Christmas advertising on television. 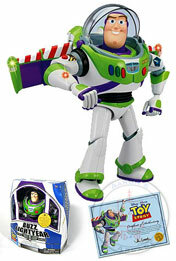 1996 Christmas rush for Buzz Lightyear toy led to a shortage before Christmas. 2000s Online Christmas shopping became popular.